I have been a little under the weather this week. Consequently, dinner hasn’t been my biggest priority, although I did pull it together enough to make marscapone stuffed french toast with honey, blueberries and pistachios. It was crazy good, not gonna lie, but mostly it’s been whatever I can throw together in the time it takes Andy to drive home. 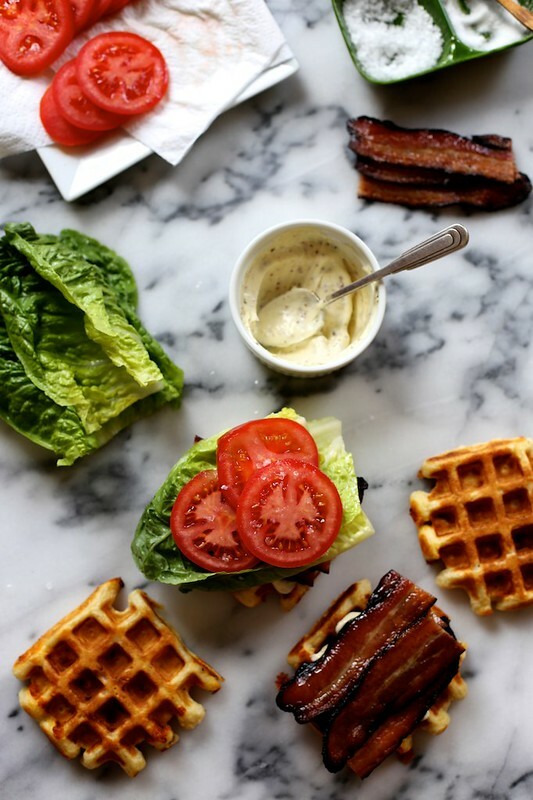 I can’t say that today will be any different, but if I were feeling motivated, I would be making these gorgeous Cheddar Buttermilk Waffle BLTS from Joy the Baker (with vegetarian bacon for me of course). You’ll have to click over to her blog for the recipe, and to see more of her adorable orange cat Tron-cat (he looks so much like Oliver!). I just wanted to share some of these mouthwatering photos. Suddenly take out doesn’t seem as appealing does it? All images from Joy the Baker. 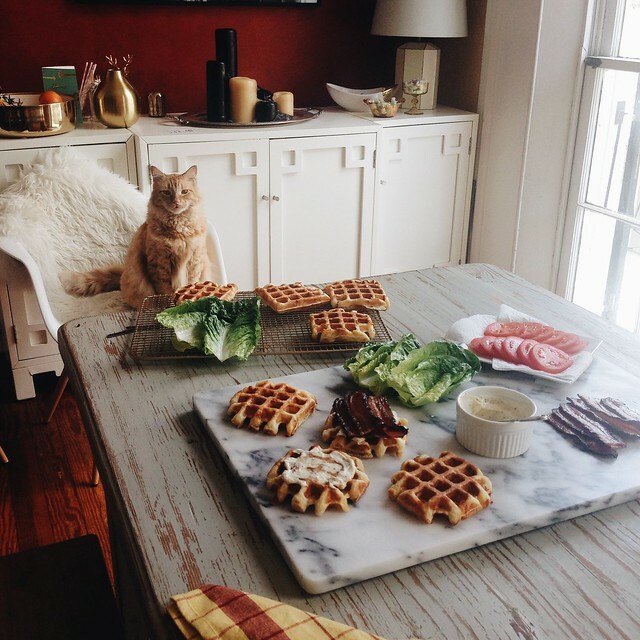 I don’t know why, but I’ve always found the idea of making waffles a little intimidating. It’s a bit silly really, if you have a waffle iron it really isn’t all the different than making pancakes, but alas my waffle iron sits lonely on the shelf collecting dust. 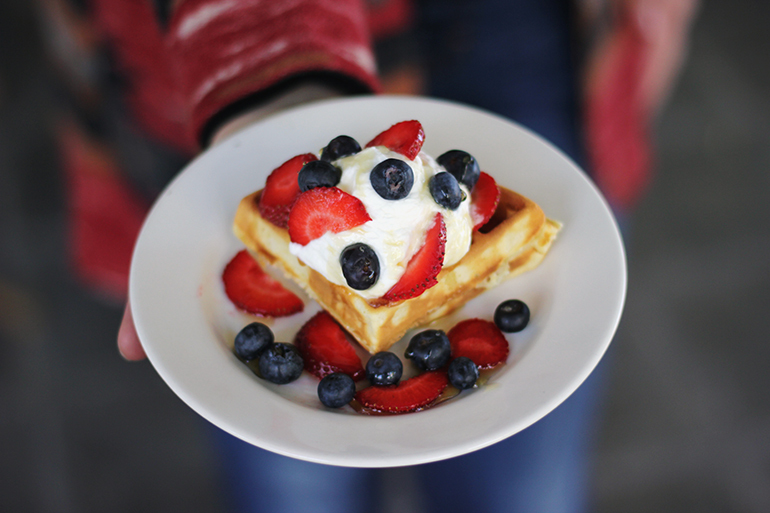 This weekend, I found this post on Merry Thought for 10 ways to top your waffles, and it has inspired me to reconsider my stand on making waffles. Maybe it wouldn’t be so bad after all…. 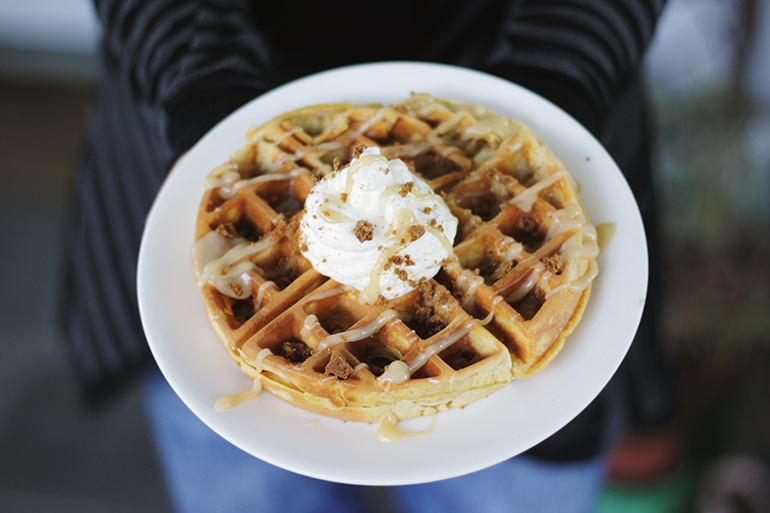 A delicious pumpkin spice waffle topped with crushed ginger snaps, maple cream sauce (recipe below), maple syrup and fresh whipped cream. 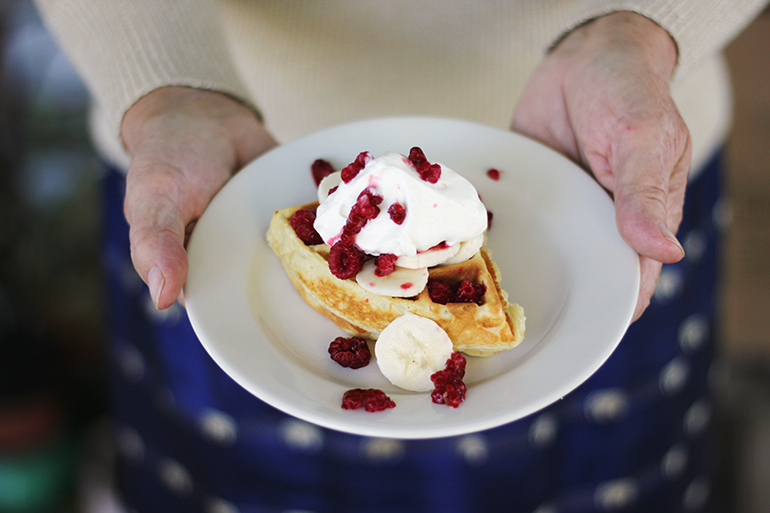 Top waffles with raspberries, bananas, fresh whipped cream and maple syrup for this fun creation. 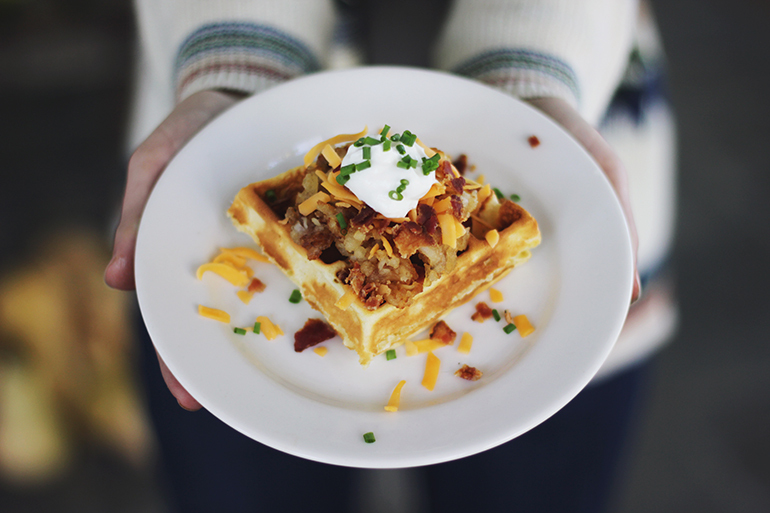 Gather all the fixings for a delicious baked potato and top your waffle with some hashbrowns, cheddar, crispy bacon, sour cream and some scallions. Keep it classic with an old school banana split. 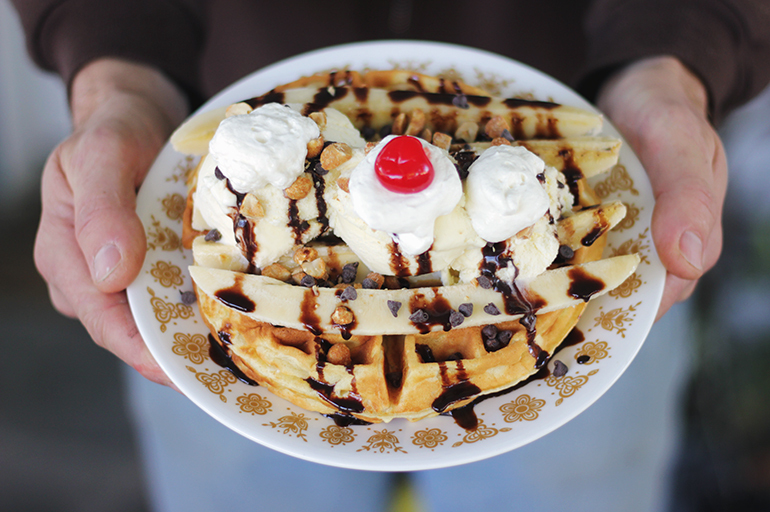 Cut up some bananas, scoop a few generous scoops of vanilla ice cream and add chocolate syrup, a few peanuts and mini chocolate chips, and whipped cream. And don’t forget the cherry on top! 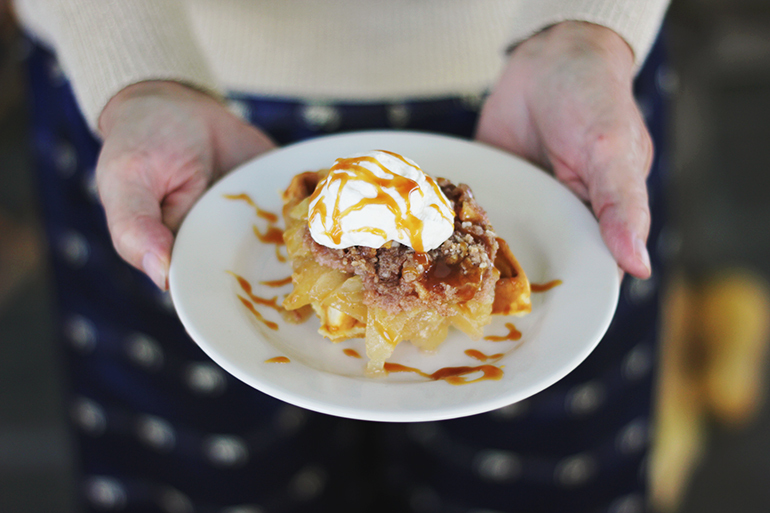 Top your waffle with homemade apple crisp (we’ve got a yummy recipe for that here), fresh whipped cream and some salted caramel sauce drizzled on top. 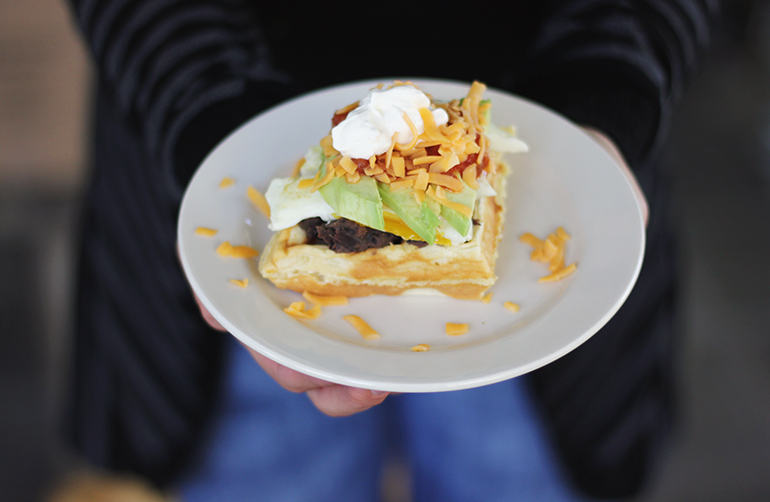 This loaded waffle is sure to satisfy the hungry lumberjack in your life. 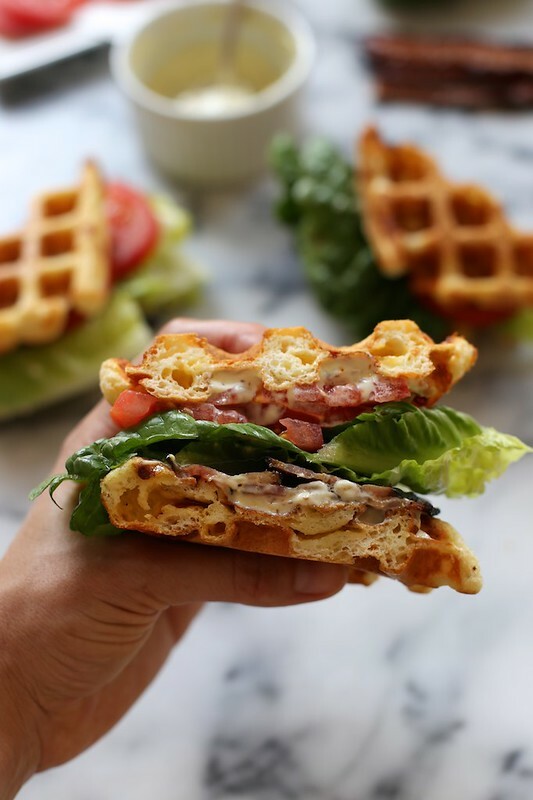 Mix some cooked sausage into your waffle batter and cook it. Add generous helpings of sausage gravy, hashbrowns, a couple fried eggs and some crispy bacon. 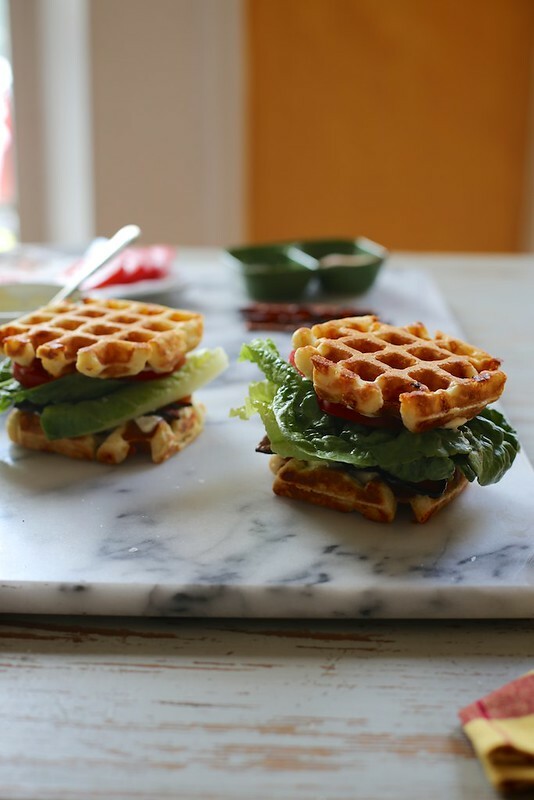 A waffle that the kids are sure to love! 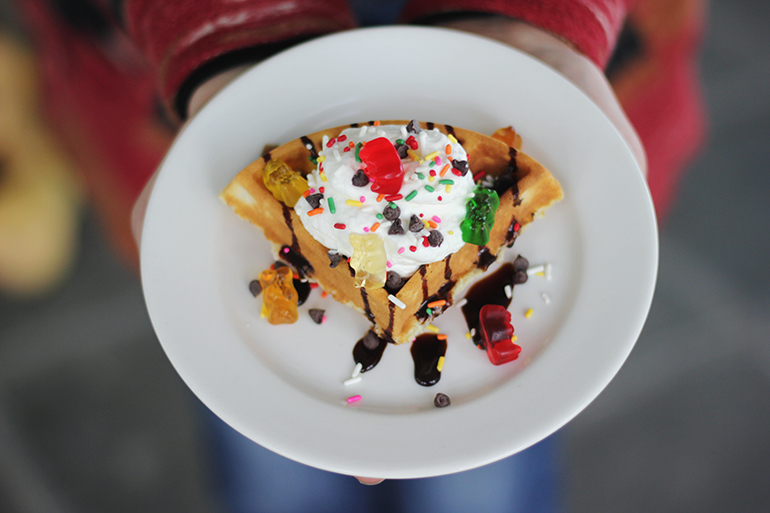 Drizzle some chocolate syrup over your waffle and let the kids throw on some of their favorite snacks – whipped cream, chocolate chips, gummy bears, sprinkles…whatever their little heart desires! 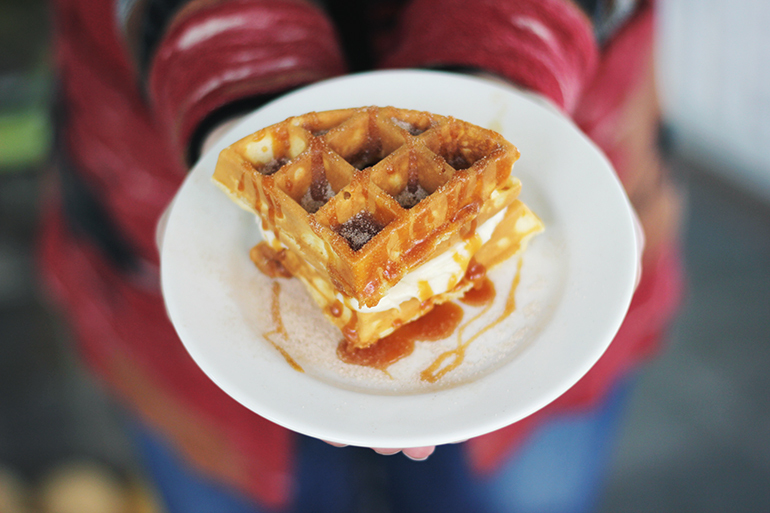 Spread maple cream cheese frosting between two waffles, top with sugarmon (cinnamon and sugar mixed together), and salted caramel sauce. For those that enjoy huevos rancheros, top your waffle with seasoned black beans, eggs, avocado, salsa, sour cream and some shredded cheddar cheese. In a medium saucepan, combine the syrup and butter and cook over low heat until butter is melted. Stir in brown sugar until dissolved and remove from heat. In a medium microwave-safe bowl, soften the cream cheese until it can be stirred smooth by hand. Gradually pour the maple butter mixture into the softened, stirred cream cheese, mixing well as you add the maple mixture. Add a drop or two of maple extract (or as much as you would like to taste) and stir until combined. Leftover sauce should be stored, covered, in the refrigerator. To use, heat in the microwave until it reaches desired consistency. Images and recipe from here. Sunday brunch is one of the weekend activities I love best; it’s the perfect compliment to sleeping in and bumming around on the last day of freedom before a new work week starts. Andy and I enjoy it so much that we are having a Sunday Brunch themed wedding. Recently, Kool Beanz Cafe, one of the great restaurants only a few blocks from our apartment, started serving Sunday Brunch. It is the perfect place to get delicious comfort food with a twist. Yesterday, we dropped in on our way to meet our wedding planner. Andy got the most amazing pancakes with peach compote topped with marscapone and accompanied by candied bacon. I ended up stealing some…okay almost all, of the bacon. I went for a play on the southern classic chicken and waffles. Buttermilk tabasco fried chicken over a sweet potato pecan waffle with honey-chile syrup. And all I can say is YUM! We almost had to be rolled out of the restaurant, but it was so worth it.